Our mission to advance women in leadership has many layers and while each city network is constantly working at the bottom of the pyramid through everyday pillar programs and initiatives, a major part of our work is advocacy, including high-level partnerships and representation. A successful example comes from PWN Romania that has been invited to join as partner in one of the most important women-dedicated international conferences, in November 2017. 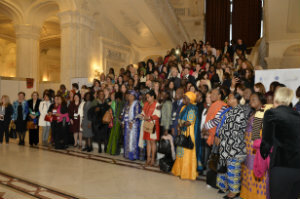 The 2nd Francophonie Women's Conference focused on the theme of "Creation, Innovation, Entrepreneurship, Growth and Development: Women are needed!" 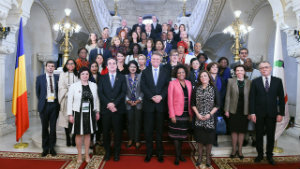 The 2-day event was initiated by the Secretary General of Francophonie, and held under the high patronage of the President of Romania, who is also an Impact Champion of the HeForShe UN-campaign (HeForShe10x10x10). During the conference, the network of Francophone businesswomen was launched, with an aim to facilitate cooperation among businesses in Francophone countries. As an active partner of the organizers, through the National Agency for Gender Equality of Romania, PWN Romania was involved from the very beginning in the organizational efforts. Confirming the well-deserved title of PWN "President of the Quarter" awarded last July, Virginia Oțel spared no efforts in spreading the word and encouraging as many local businesses and business women as possible to join the event. As such, Romania was well represented in the architecture of an event bringing together some 700 participants around the world – government officials, civil society representatives, and businesspeople. Virginia was also invited as grand temoin to deliver a presentation about PWN Romania's efforts in advancing women in leadership, during the debates held under the axis of "Women leadership in economic governance" – decision making and means of action. Speaking about what PWN Romania does in this respect, in just 10 minutes, is no easy task. Our colleagues are working hard at growing the local community and have developed the first pillar-based workshops organized within our organization. They have also built a strong "Women on Boards Academy" program, including a pipeline for Board-ready women, successful advocacy work and engaging men to promote the need for Board gender balance, as well as a valid pipeline for Board Ready Women. And while the response from the key audience is substantial, obstacles remain considerable in a country still going through major transformations. Echoing the "Women are needed!" highlight of the conference, Virginia ended her presentation with a call to action for joint efforts in supporting access of women to Board positions. Official photos are available here (Romanian Presidency) and here (Ministry of External Affairs).